This article on drug development in fiction is part of the Science in Sci-fi, Fact in Fantasy blog series. Each week, we tackle one of the scientific or technological concepts pervasive in sci-fi (space travel, genetic engineering, artificial intelligence, etc.) with input from an expert. Please join the mailing list to be notified every time new content is posted. Bradley Johnson is a biochemist and drug development scientist by day and a science fiction and fantasy writer by night. He’s worked in the biopharmaceutical industry for over 18 years, developing drugs that treat cancer, blood disorders, and rare genetic diseases. He received his Ph.D. in Microbiology and Molecular Genetics from the University of Texas Health Science Center at Houston. When he isn’t working on cutting edge drugs, he is revising his current work in progress, a middle grade science fiction adventure set on Jupiter’s moon, Europa. You should follow him on Twitter. Drug development is the process in which a new drug is developed and manufactured for commercial use. Biopharmaceutical companies screen thousands of new compounds to find one that is effective to treat a disease. For the new target to be used in humans, the drug must be developed and manufactured in a way that will make it safe for humans. This work is called process development and is typically performed by scientists and engineers. Advancements in drug development technologies have led to the rapid growth of this field. It has also brought to the news, headlines that question drug companies profiting.1 Despite these arguments, it’s clear that many of this new class of drugs have improved the treatment of cancers, genetic disorders, and rare diseases. This article will be a primer on drug development and my hope is it will empower science fiction writers with the basic information needed to accurately depict this exciting field in their stories. Drug development takes time and money. 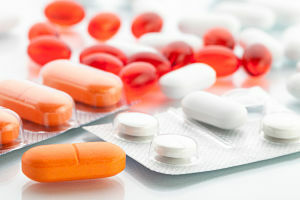 The average drug takes roughly 12 years to develop from the initial concept to release on the market2 and the cost of developing them has risen significantly, with recent estimates as high as $2.6 billion.3 The high cost and time to make a drug can be related to the complexity of the types of drugs developed by biopharmaceutical companies. Today, biopharmaceutical drugs fall into four main categories, small molecule, large molecule, cell-based, and gene therapies. Small molecule drugs are chemicals. They are tiny in terms of their size, usually less than 900 Daltons or 0.1 nm (if you want to get a visual of how small these drugs are check out http://learn.genetics.utah.edu/content/cells/scale/).4 These drugs should be familiar, because they’re easily purchased at the pharmacy, i.e. aspirin, antibiotics, etc. Small molecule drugs are typically synthesized by chemical reactions. They can have a specific action on disease, such a penicillin targeting the cell wall of bacteria. Or they can have a more global impact, i.e. anti-mitosis chemotherapy drugs that hit cancer and healthy cells indiscriminately. Large molecules, also called biologics, are drugs bigger than small molecules (duh, right). 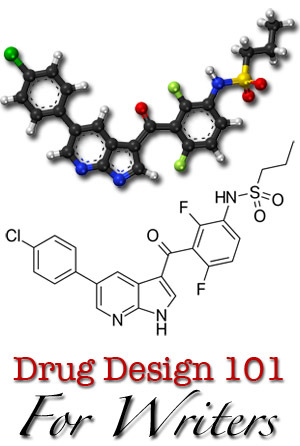 They are popular today because they’re considered designer drugs to target specific diseases. They are usually protein-based and range in sizes from 20 to 2,000 kilodaltons. Biologics are injected into humans because of drug instability when taken orally. Diseases treated with this class of drugs include cancers, blood disorders, and genetic and other rare disorders. The most common biologic drug on the market is called a monoclonal antibody (mAb). 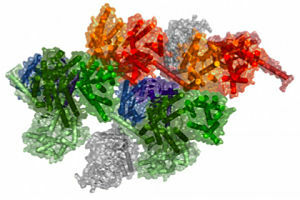 In biochemistry, antibodies are an important part of our immune system that targets infections to kill or remove them. They circulate in the blood and target microorganisms, so the immune system can destroy them. Scientists have genetically engineered mAbs to harness their ability to bind other molecules in order to target specific diseases. For example, antibody drug conjugates have been designed to deliver a toxic payload to cancer cells.5 After the mAb binds specifically to the cancer cell, the drug is engulfed by the cells and the toxin released, killing the cancer. Since the mAb drug recognizes only the cancer cell receptors, healthy cells in the body are left unharmed. Protein replacement therapy involves replacing a missing enzyme or protein with a biologic drug. Some patients have mutations in their DNA that destroy key enzymes or proteins that result in debilitating diseases. In these diseases, drugs that have been cloned from healthy DNA are manufactured in cell bioreactors and purified to be administered as molecule replacements. The hope of biologics is they will provide a better quality of life for patients. Gene therapy, as its name describes, uses genetics or DNA to treat or cure the disease. Gene therapy works to replace the mutated gene. Viral vectors are used in these type of drugs, but new genetic technologies like CRISPR-Cas96 are making it possible to edit mutated genes. Popularity for gene therapy waned after early treatments caused deaths in patients, but with the discovery of gene editing proteins and the recent approval of a novel gene therapy by the Food and Drug Adminstration,7 these therapies could become the future of medicine because they have the potential to cure the disease. Cell therapies are treatments using stem cells to treat or replace damaged or dead tissue. The excitement around stem cell research is they can be differentiated into unique types of cells, (i.e. liver cells, neurons, etc.) and essentially rebuild a broken tissue or organ. See also Megan Cartwright’s Science in Sci-fi article on organogenesis in 3D. Drug development aims to make targeted medicines and treatments using chemicals, biologics, and other therapies. Scientists and biotech companies are working hard to find new drugs to treat hard to cure diseases, some of which may impact only a small number of the world’s population (<5,000). With further advancement in science, therapies for diseases that were in the past untreatable may developed. LaMotta, Lisa “What Gilead taught pharma about pricing a cure.” Biopharma Dive 12, 2018. Deep Dive. Mullen, Rick “Tufts Study Finds Big Rise in Cost of Drug Development”. Chemical & Engineering News 92(47): 6 Nov. 20, 2014. News of The Week. Torjesen, Ingrid “Drug Development: The Journey of a Medicine from Lab to Shelf”. The Pharmaceutical Journal. May 12, 2015. Is Medicine Ready for Clinical CRISPR? John Parrington. The Scientist. Dec. 1, 2016. Reading Frames.